“Out with the old, in with the new,” as the saying goes. And it applied to the Sea Eagle Explorer series inflatable kayaks in 2012 when Sea Eagle completely re-designed their popular 380x and 420x kayaks. I own the “pre-2012” model of the 380x and it is the primary inflatable boat I use. I use it for fishing, lake paddling, day floats and, above all, longer overnight trips. The kayak has hauled me (and all my gear) on 12 days float trips through remote, barren country. Yet the kayak works just as well for fun recreational day floats down nearby and popular rivers. And on a few occasions, I’ve taken it through weaker Class IV whitewater and survived to tell the tale. Ultimately, what I love about the 380x is the boat’s sheer versatility. It’s not the best lake-paddling kayak—not by a long shot. It also isn’t the best for pure whitewater rapids—nobody is going to mistake my kayak for a dedicated inflatable whitewater kayak such as those made by Aire or NRS. Yet my kayak can run rapids and paddle across flat water well enough to keep me satisfied. But unlike these other boats, I can then load up my kayak and take it on long—sometimes real long—float trips loaded down with enough food and camping gear to last two or more weeks. This is my older (2003) Sea Eagle 380x, about to set off on a twelve-day float through the Missouri Breaks National Monument in Central Montana. In short, my kayak is a true workhorse. Indeed, the only thing I’ve done to the boat is to add four new D-Rings to make it simpler to add seats and attach gear. And to make gear attachment even simpler, I’ve strung marine rope down both sides of the kayak—and this rope remains attached to the kayak at all times. My inflatable kayak has provided me with faithful, reliable and superb performance the past fifteen years. Yet, I’m envious—jealous even—of the newer models of Sea Eagle Explorer kayaks. I’ll explain why in the remainder of this article. When Sea Eagle redesigned the Explorer series of kayaks, they made a number of changes. So let’s go over them and why these changes have given me a serious case of envy. One of the two huge changes Sea Eagle made to this kayak was the completely re-designed floor. 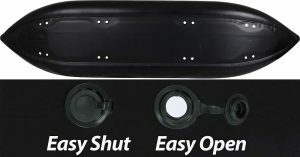 On my kayak, the removable floor is made from tough polyester—the same polyester that was then used in their popular Sea Eagle 370 inflatable kayaks. My floor has never leaked. But, it isn’t stiff either. It is rather soft. And you only inflate to a bit over 1psi, in contrast to the rest of the boat that is inflated to 3.2psi. The newer Sea Eagle Explorer kayaks, however, use this wonderful drop-stitch floor. This floor, which is inflated to a very high psi, is so stiff that you can stand upright in the boat without the boat tipping. For anglers, or anyone who simply needs to stand for a bit to stretch their legs, this is a huge thing. Moreover, the drop stitch inflatable floor is substantially tougher than the old style inflatable floor used in my kayak. While I’ve never once worried about poking a hole in the pontoons of my kayak, I am always “mindful” of leaving sharp objects (such as hooks or knives) on my kayaks inflatable floor. All Sea Eagle Explorer inflatable kayaks are designed for Class IV whitewater. The tough fabric of the boat allows the kayaks to be slammed into rocks without puncturing, or to slip right over submerged rocks without tearing up the bottom of the boat. But there’s another factor that makes these inflatable kayaks able to navigate Class IV whitewater—and that is the use of drain valves. All Sea Eagle Explorer kayaks have drain valves that can be left either open or closed. For those not familiar with how this works, you keep the valves closed for flatwater paddling (lakes and rivers lacking significant whitewater) so as to keep the inside of the kayak dry at all times. However, to run heavy whitewater, you open the valves. By opening the valves, you convert the kayak to a “wet kayak.” The drain valves are located just a smidgen above the waterline. This allows water that enters the boat when running rapids (and when running Class IV rapids, do expect a lot of water to enter the boat!) to drain out. On my older 380x, the kayak had four of these drain valves—two up front and two in the rear. The drain valves are very large—you can nearly stick a small hand through it. Unfortunately, there are no valves along the sides of the kayak. As a result, when water entered the boat it tended to “collect” right below where I was sitting (since my weight is the heaviest part of the boat). And since my kayak doesn’t have a drop-stitch floor, my weight tended to cause a small bend in the “floor” of the kayak—allowing some of the water to pond up right beneath me. This water in my boat posed no threat of capsizing the kayak. Nor did it cause any sort of danger. However, sitting in a pond of water is annoying after a while. And the water adds just enough weight to make to make maneuvering the boat somewhat of a challenge, especially if the boat is hauling one hundred pounds of gear in addition to myself. The newer Explorer kayaks, however, don’t suffer from these problems. These kayaks have sixteen drain valves—two in front, two in back, and the remaining twelve located down both sides of the boat. These additional valves (each of which are smaller than the large ones on mine) greatly assist with draining water from the boat. Plus, the stiff drop-stitch floor prevents “sagging” of the floor directly beneath the paddler. As a result, paddlers won’t find themselves sitting in a “small pond” of water. Or to put it another way, the stiff floor prevents the drain valves from being forced “underwater” due to the weight of the paddler and their gear. The result of this is that the newer Sea Eagle Explorer series kayaks are much easier and more comfortable to use in “wet kayak” mode—or when the drain valves are open. 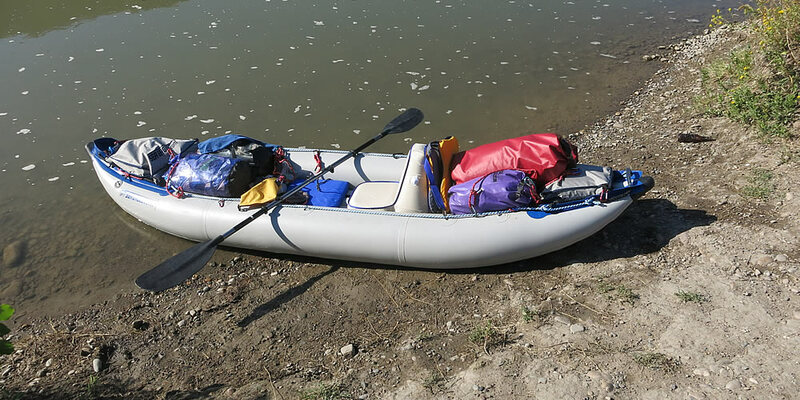 For overnight floating and running significant whitewater, the new Sea Eagle Explorer inflatable kayak’s combination of drop-stitch floor and new drain valve locations are a significant improvement over my kayak. I’ve never considered my kayak as “heavy.” I have never had problems carrying it myself. Still, nobody would consider it lightweight, either. With the floor installed and the seats attached, it probably weighs around 50-55 lbs. Technological enhancements the past fifteen years, combined with use of the drop-stitch floor, have shaved significant weight from the newer Sea Eagle Explorer kayaks. The new 380x weighs 40 lbs while the 420x weighs just 45. Less weight is always better than more weight. Another big difference between older 380x’s like mine and the newer 380x kayaks is that the new kayaks come with a slot to slide in a detachable skeg. 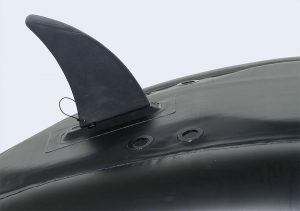 A skeg allows the kayak to track straighter during paddles on lakes and other flat water. In short, the skeg greatly reduces yaw. My old kayak does have a skeg, but I installed it myself after buying it separately. And the skeg on my kayak isn’t nearly as easy to remove/install as the skegs are on the newer 380x. This is a big change, especially for those who plan to do lots of flat water paddling on lakes and slow-moving rivers. This is the least important change, obviously. Still, I find the blue/gray color of the newer kayaks much more appealing to the eye than the rather boring all gray color of my own kayak. There’s no change in performance, obviously, but it’s never hurtful to have a kayak that appeals to the eye—especially if you’re looking at the boat all day during a two-week float trip. 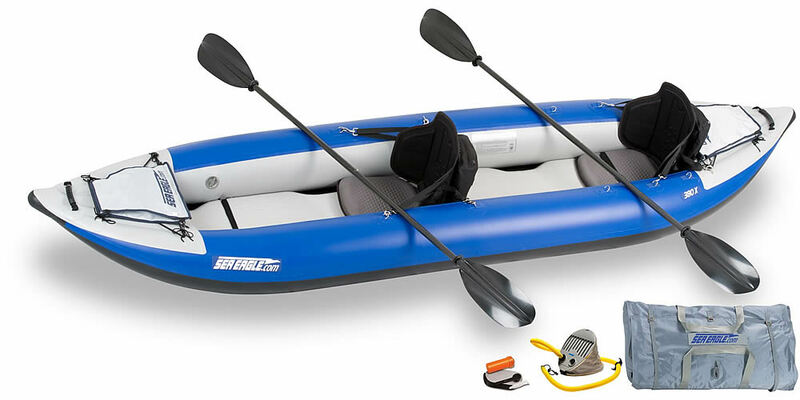 The changes made by Sea Eagle to their Explorer Series inflatable kayaks are not minor or cosmetic. The changes are significant and greatly add to the boats performance. Most importantly, the combination of improved drain valve locations and, above all, the stiff drop stitch floor greatly improve the kayaks performance in whitewater and strong rapids. The stiff drop stitch floor also prevents “sagging” and thus “ponding” of water beneath the paddler. The easily detached skeg is also a great feature for people who spend lots of time paddling across lakes and other flat water.